When you’re drawing a dude’s arms, don’t aim for Muscle Beach in fashion drawing. Male arms can look toned and terrific without making people’s heads swivel in disbelief at their size and shape. Keep in mind that men’s shoulders are wider. 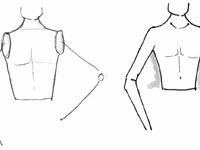 1Lightly sketch a torso with armholes. Add the neck to help visualize the upper body. 2Draw two bent arms using straight lines and circles for the elbows. 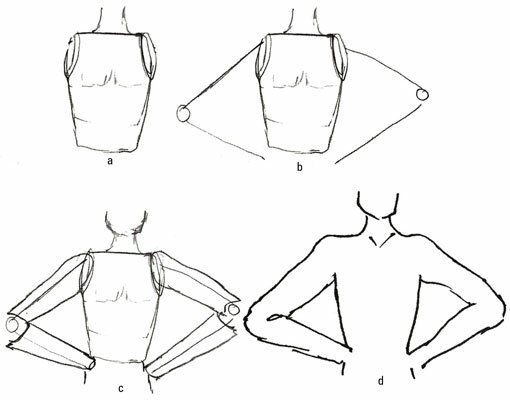 Keep the height of the elbow a little above the horizontal line of the waist. 3Add cylinders over the arm lines, keeping the circles to represent the elbows. 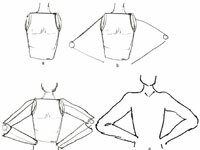 If you want to tackle some long and lean arms for men, use the preceding steps, but when you draw the cylinders in Step 3, draw them thinner and more similar to a woman’s arm. 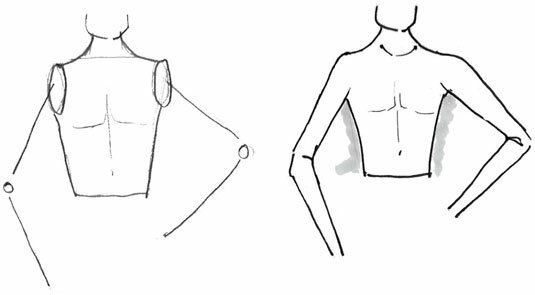 Scrawny arms on men often are viewed negatively, but some fashion illustrators go that route for their fashion look. Working out at the gym isn’t a priority for these dudes; they prefer a long and lean image. You won’t see these guys’ arms on parade at the beach; instead you’ll more likely find them hidden under a flannel shirt or a hoodie. A much-loved T-shirt is the signature statement for this group of guys. 4Sketch in a head and round out some of the perimeter lines around the arms for muscle definition. You can draw pipe cleaners for a guy’s arms, but you must always draw shoulders. Sloping necklines aren’t allowed for guys, so keep the shoulders broad.